This bell is a special bell to give to one sharing endearing memories of times past. The Memorabell's three sides denotes a story of a Great Love represented by Heart (side one), Soaring through the sky represented by a Thunderbolt, to the Moon and Stars represented on the final plate. The bell has three lovely tones. It is powder coated a beautiful 'pearlescent' silver! 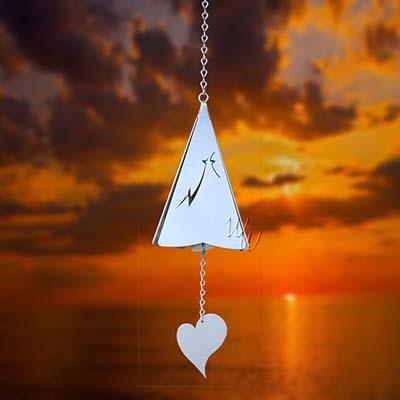 This bell has four windcatchers to choose from, Dream Heart, Lightning Bolt, Silver Star, and Black Star. The inside of the hang tag carries the above message and the right hand side is open to write a little message with in the tag.